Calcium Rich Smoothies, Calcium Rich Juice Recipes , Calcium Rich drink recipes. Milkshakes, Smoothies, lassis and other drinks are perhaps the most obvious ways to top up on Calcium Rich Recipes. However, you will be amazed by the sheer variety that this repertoire offers, and the innumerable drinks, ranging from smoothing ones and refreshing ones to energising ones and peppy ones, which can be made with calcium-rich ingredients like milk, curds and dates. The most important element of Calcium is curds in a smoothie. For an Athlete try Papaya and Green Apple Smoothie as it will give you sustained energy being rich in calcium and protein. If you can make homemade peanut butter then definitely try Peanut Butter Blueberry Almond smoothie. Make this Anti Cancer Spinach Juice and carry it to work. Our favourite is the Blueberry Orange Curd Smoothie which tastes great and gives you that energy boost at work in the afternoon. Drinks as a snack on the go. There is nothing easier than buying a tetra pack of Almond milk with no sugar added and carry it with you. Its a perfect snack woth calcium and protien combined in it. You can follow our foolproof and easy Homemade Almond Milk recipe or our Saffron Cardamom Almond Milk. 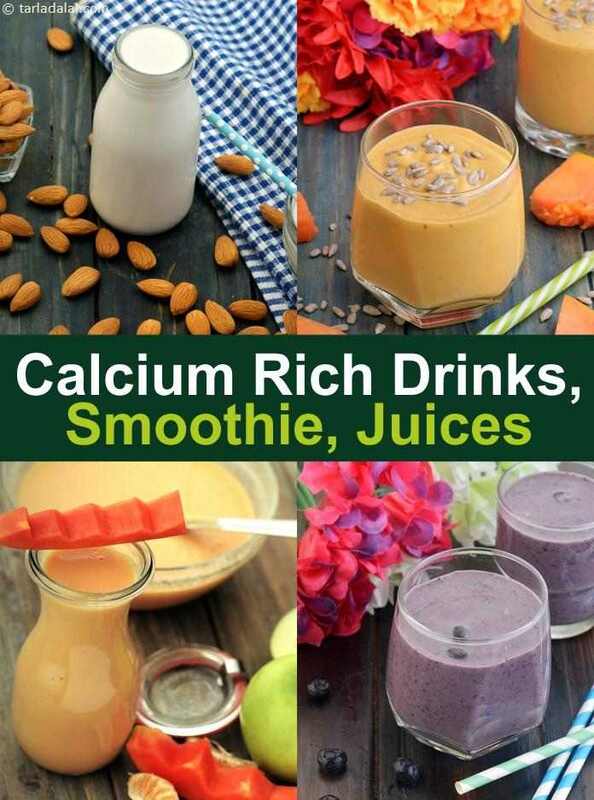 Enjoy our collection of Calcium Rich Smoothies, Drink, Juice Recipes given below from Calcium Rich Breakfast to Desserts.